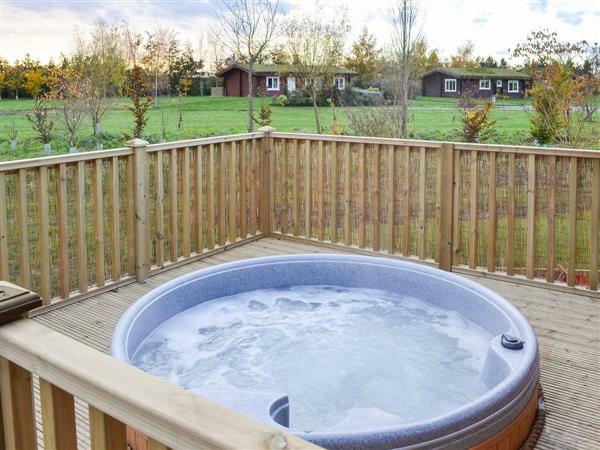 Teal Lodge at Mackinder Farms in Brayton, Selby, Yorkshire sleeps 6 people. Mackinder Farms in Brayton is located amidst arable farmland; a collection of cottages and contrasting eco-friendly lodges. The holiday cottages (refs W42586 [Stables Cottage], W42941 [The Hayloft], W42942 [The Forge]), lovingly converted from 18th-century farm buildings, have been carefully renovated retaining many original features including beams and roof trusses and exposed brick and stone work. Each cottage has been tastefully furnished to a good standard and offer excellent facilities. There are private gardens and care has been taken to ensure guests enjoy their privacy. The superb Nordic pine log cabins (refs W43008 [Partridge Lodge], W43009 [Pheasant Lodge], W43170 [Kingfisher Lodge], W43171 [Mallard Lodge], W44304 [Quail Lodge] and UKC2565) offer eco-friendly holiday accommodation with grass roofs and renewable, underfloor heating. Each lodge enjoys a private hot tub including hot tub towels, and are perfect for relaxing and soaking up the tranquillity of the surroundings. There are separate garden areas and great care has been taken to ensure guests enjoy privacy. Medieval York is just 17 miles away, with easy access to the city from the designer outlet park and ride, 15 miles. Hull with its futuristic aquarium, Leeds and the Royal Armouries and the elegant spa town of Harrogate are all within an hour’s drive. The coastal resorts of Filey, Scarborough and Whitby are easily accessible. The shop, pub and restaurant are all 1 mile from Mackinder Farms in Brayton. Refs W42941 [The Hayloft] and W42942 [The Forge] have an interconnecting door and can be booked together to sleep up to 10 people. The properties can be booked together to sleep up to 47 people. Teal Lodge is all on the ground floor. Living area: With Freeview TV and DVD [Well Cottage] player. Air source underfloor heating and Wi-Fi included. Travel cot and highchair. Decking with sitting-out area and garden furniture. Hot tub for 6 (private). Wheelchair access. All properties: Electricity, bed linen and towels included. Laundry room with coin-operated washing machine and tumble dryer (shared with other properties on-site). 5-acre landscaped grounds (shared with other properties on-site). Private parking for 2 cars. No smoking. Please note: The property has a natural water supply from a borehole, the grounds border a canal. Holidays at Teal Lodge, Mackinder Farms run from Friday to Friday. Pets allowed at Mackinder Farms - Teal Lodge. For a better idea of where Mackinder Farms - Teal Lodge is, you can see Mackinder Farms - Teal Lodge on the map below. Mackinder Farms - Teal Lodge is in North Yorkshire; should you be on the lookout for a special offer, you can find all the special offers in North Yorkshire. It's always worth checking to see what is on offer at the moment. Do you want to holiday near Mackinder Farms - Teal Lodge (UKC2565), you can see other cottages within 25 miles of Mackinder Farms - Teal Lodge; have a look to find your perfect holiday location.